As the title suggests, this tale by Shelley Weiner is about telling the truth and telling lies, a clever novel of social comment which made me smile frequently at the spot-on observations. Beneath the humour though, are layers of contradictions, degrees of untruths and some wicked humour. 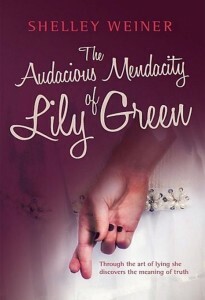 Just as Lily doesn’t know her mother, she also doesn’t know herself. She tears cuttings from women’s magazines – how to lose weight, how to cook lobster, how to seduce a man – as if she is casting around for behaviour which will give her a clue to her own identity. So she sets off from Hatch End… to London, a journey of 18 miles, hardly a grand adventure. But that’s the point; Lily could make this journey from the house she shares with her mother, but she lacks the self-confidence and ability to assert herself. She knows neither herself, nor her mother, and therefore flounders to find a place in the world. But as she invents a life and personality for herself, she meets other people who tell the truth and tell lies: how can she distinguish between them? A funny novel which can be read on two levels: a quick poolside read for your holiday, or a social commentary which as you read it will make you review how much you tell the truth. And do you really know your own mother? For more about Shelley Weiner’s other novels, click here for her website.